Hot! Hot! Hot! | A.B.E. Remodeling, INC.
Hello out there. 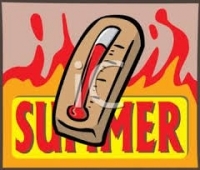 Here we are in these very HOT days of August... We sure hope you are taking this heat well. I got to thinking about that Christmas-winter song... that states "Baby-it's cold out there" and how someone should just remake that into a summer song cos "Baby, it's HOT out there. Okay, go ahead and hum it in your head 'baby-it's hot out there'. Now quick.. how many "songs" can you jot down that pertain to hot or "Summertime"? Here's a few to get you started; "Grease - Those hot summer nights" , Hot! Hot! Hot! Summer Breeze, "Summertime" - okay your turn to continue the list. It's something to do in your spare time..and it lets those brain cells be active (and that's good for the mind). Don't let a good mind go to waste. Now thinking of this heat... perhaps you would like to add a porch to your home for some shading or maybe a pergola in the yard. Hey, give us a call-we do it all ! Now back to the subject of heat and.. working your brain cells. How many ways can you think of that "will beat" the heat? Your comments are welcome. So for now, we close with a note to keep your cool during these hot summer days. (on days like this it almost feels hot even in midst of air conditioning). Enjoy your days and nights. Hang in there - you know the colder days will be upon us in a few months. Be of good cheer.